H.R. 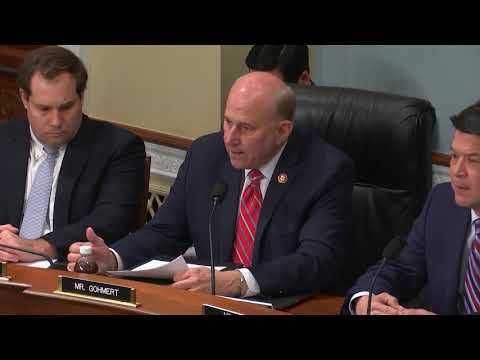 3593 (Rep. Mike Johnson of Louisiana), To amend the Wilderness Act to authorize U.S. Customs and Border Protection to conduct certain activities to secure the international land borders of the United States, and for other purposes. Securing Our Borders and Wilderness Act. H.R. 5025 (Rep. Aumua Amata Coleman Radewagon of American Samoa), To amend the Western and Central Pacific Fisheries Convention Implementation Act to limit the imposition of penalties against a person fishing on a United States flag fishing vessel in certain areas of the Pacific Ocean based on a report by an observer on such a vessel. H.R. 6507 (Rep. Glenn Thompson of Pennsylvania), To amend the Oil Region National Heritage Area Act to reauthorize the Oil Region National Heritage Area, and for other purposes. Oil Region National Heritage Area Reauthorization Act. H.R. 6602 (Rep. Frank A. LoBiondo of New Jersey), To reauthorize the New Jersey Coastal Heritage Trail Route, and for other purposes. H.R. 6652 (Rep. Dan Newhouse of Washington), To direct the Secretary of the Interior to convey certain facilities, easements, and rights-of-way to the Kennewick Irrigation District, and for other purposes. H.R. 6939 (Rep. Liz Cheney of Wyoming), To protect and ensure multiple use and public access to public lands in Wyoming per the request of the respective counties, and for other purposes. Restoring Local Input and Access to Public Lands Act of 2018. S. 245 (Sen. John Hoeven of North Dakota), A bill to amend the Indian Tribal Energy Development and Self Determination Act of 2005, and for other purposes. Indian Tribal Energy Development and Self-Determination Act Amendments of 2017. S.669 (Sen. Jeff Merkley of Oregon), A bill to authorize the Secretary of the Interior to assess sanitation and safety conditions at Bureau of Indian Affairs facilities that were constructed to provide affected Columbia River Treaty tribes access to traditional fishing grounds and expend funds on construction of facilities and structures to improve those conditions, and for other purposes. Columbia River In-Lieu and Treaty Fishing Access Sites Improvement Act. H.R. 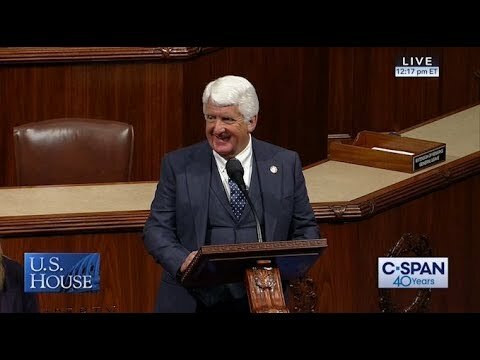 3593 (Rep. Mike Johnson), To amend the Wilderness Act to authorize U.S. Customs and Border Protection to conduct certain activities to secure the international land borders of the United States, and for other purposes. “Securing Our Borders and Wilderness Act”. The Subcommittee on Federal Lands was discharged from further consideration of H.R. 3593 by unanimous consent. An amendment offered by Mr. Mike Johnson [#1], was agreed to by voice vote. H.R. 3593, as amended, was adopted and ordered favorably reported to the House of Representatives by a roll call vote of 19 yeas and 12 nays. H.R. 5025 (Rep. Aumua Amata Coleman Radewagen), To amend the Western and Central Pacific Fisheries Convention Implementation Act to limit the imposition of penalties against a person fishing on a United States flag fishing vessel in certain areas of the Pacific Ocean based on a report by an observer on such a vessel. The Subcommittee on Water, Power and Oceans was discharged from further consideration of H.R. 5025 by unanimous consent. H.R. 5025 was adopted and ordered favorably reported to the House of Representatives by voice vote. H.R. 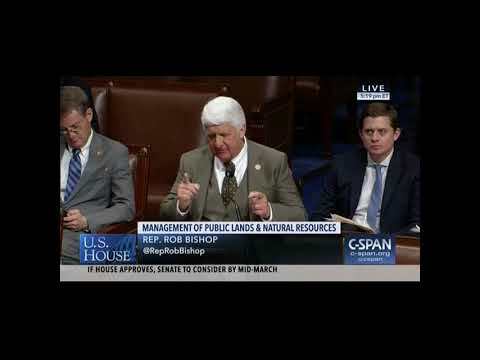 6507 (Rep. Glenn Thompson), To amend the Oil Region National Heritage Area Act to reauthorize the Oil Region National Heritage Area, and for other purposes. “Oil Region National Heritage Area Reauthorization Act”. The Subcommittee on Federal Lands was discharged from further consideration of H.R. 6507 by unanimous consent. H.R. 6507 was adopted and ordered favorably reported to the House of Representatives by unanimous consent. The Subcommittee on Federal Lands was discharged from further consideration of H.R. 6602 by unanimous consent. H.R. 6602 was adopted and ordered favorably reported to the House of Representatives by unanimous consent. H.R. 6652 (Rep. Dan Newhouse), To direct the Secretary of the Interior to convey certain facilities, easements, and rights-of-way to the Kennewick Irrigation District, and for other purposes. The Subcommittee on Water, Power and Oceans was discharged from further consideration of H.R. 6652 by unanimous consent. An amendment offered by Mr. Huffman , was agreed to by unanimous consent. H.R. 6652, as amended, was adopted and ordered favorably reported to the House of Representatives by unanimous consent. H.R. 6939 (Rep. Liz Cheney), To protect and ensure multiple use and public access to public lands in Wyoming per the request of the respective counties, and for other purposes. “Restoring Local Input and Access to Public Lands Act of 2018”. The Subcommittee on Federal Lands was discharged from further consideration of H.R. 6939 by unanimous consent. H.R. 6939 was adopted and ordered favorably reported to the House of Representatives by a roll call vote of 19 yeas and 11 nays. S. 245 (Sen. John Hoeven), To amend the Indian Tribal Energy Development and Self Determination Act of 2005, and for other purposes. “Indian Tribal Energy Development and Self-Determination Act Amendments of 2017”. The Subcommittee on Indian, Insular and Alaska Native Affairs and the Subcommittee on Energy and Mineral Resources were discharged from further consideration of S. 245 by unanimous consent. S. 245 was adopted and ordered favorably reported to the House of Representatives by unanimous consent. S. 669 (Sen. Jeff Merkley), To authorize the Secretary of the Interior to assess sanitation and safety conditions at Bureau of Indian Affairs facilities that were constructed to provide affected Columbia River Treaty tribes access to traditional fishing grounds and expend funds on construction of facilities and structures to improve those conditions, and for other purposes. “Columbia River In-Lieu and Treaty Fishing Access Sites Improvement Act”. The Subcommittee on Indian, Insular and Alaska Native Affairs was discharged from further consideration of S. 669 by unanimous consent. S. 669 was adopted and ordered favorably reported to the House of Representatives by unanimous consent.